The New York (NYC) tech ecosystem (Silicon Alley) currently ranks no. 2 in the country only behind Silicon Valley. Silicon Alley owes its dynamic growth since the mid-2000s to NYC’s large capital reserves and the developed financial market, efficient technical infrastructure, and deep synergies with old industries (e.g insurance, banking). Thanks to these facilitators, the NYC tech scene today hosts many world-famous tech companies, such as BuzzFeed, Etsy, MongoDB, FourSquare, Kickstarter, just to name a few. Despite the fact that NYC’s tech ecosystem is maturing, it’s still one of the fastest growing tech hubs in the United States which draws vast amounts of venture funding, startup exits, and acquisitions. Throughout the 2010s, NYC has been shaped by a number of distinct trends: the rise of convenience-first consumer startups, a vibrant digital media market, and fast tech infrastructure development. Convenience-first consumer startups that simplify product access and delivery have been attracting a considerable amount of funding in the 2010s. The trend was set by Warby Parker, an American brand of prescription eyeglasses that began selling them in an innovative way. Instead of buying eyeglasses immediately, online users can order several frames totry them on at home and select those which they like the most. A customer-centric approach was also chosen by Blue Apron, a grocery delivery service that delivers meal recipes with needed ingredients so that you can cook your food from scratch. Over the last ten years, NYC has become one of the most dynamic digital media markets. In 2015 alone, $326 million was invested in media/publishing with the total funding reaching $923 over the last four years. Digital media startups such as BuzzFeed, Vox Media, and Vice Media are some of the most active investors in digital media themselves having acquired more than 14 startups across the country over the last four years. The NYC digital media segment includes both traditional online media, such as Business Insider, and innovative social news and online publishing platforms, such as BuzzFeed. The Booming NYC tech scene requires additional infrastructure and office space. The Growing population of NYC startups and tech companies explains the success of WeWork, a NYC startup which offers co-working space for entrepreneurs, startups, services, and various community groups. WeWork transforms commercial buildings into environments for creativity and collaboration. Mushrooming startups are fueling this trend making WeWork the third largest unicorn in the country. In July 2017 the company’s valuation hit $20 billion after it raised $760 million in a Series G funding. According to the 2016 NYC Startup Report, B2B (Business-to-Business), Consumer Web, HealthTech and FinTech were the fastest growing sectors of NYC tech market in 2016. 111 companies that offer software services and SaaS platforms to businesses (B2B) collectively raised $3.9 billion. The upward trend in this sector was set by Infor, the largest tech company in New York with a gross revenue of $2.8 billion in 2016. The company that builds multi-purpose industry suites in the cloud and helps companies deploy their software, raised a whopping $2.5 billion in 2016. Another B2B giant Logicworks that helps its clients manage their cloud environments raised $135 million in funding. 63 consumer web and mobile startups also performed well, managing to raise $848 million in 2016. On-demand mobility and ride-sharing services were especially successful echoing the global trend set by Uber. For example, Gett, a global ride-sharing company founded in Israel managed to raise $400 million in two rounds. Via, another on-demand mobility service, followed suit raising $100 in the previous year. HealthTech, represented by 36 companies, continues its march on the elite of the NYC tech scene. Being one the fastest growing sectors over the past 5 years, HealthTech raised over $951 million in 2016. Two companies that secured the largest amounts of funding were Oscar Health a tech unicorn which raised $400 million and Flatiron Health with $175 million. Among other HealthTech startups that made it big in 2016 one should mention MedCPU ($59 million), Quartet ($40 million) and Progyny ($87.8 million). Similarly, being an outgrowth of New York’s powerful financial sector, FinTech continues its rapid development. In 2016, 35 FinTech companies raised over $459 million becoming the fourth fastest growing tech sector in New York. Betterment, a startup that offers personalized financial advice and automated investment management, was the leading company of the NYC FinTech sector. The robo-advisor collected $100 million in its Series E funding. Along with the mentioned industries, NYC tech scene is witnessing the rapid development of Big Data and business intelligence startups. Two startups in this niche, Sisense, and Datadog, raised $94 million and $147.9 million accordingly. Similarly, NYC AdTech with such powerful startups as AppNexus and MediaMath strengthens its position on top of the NYC startup ecosystem. In particular, in 2016 significant funds were raised by such AdTech companies as Foursquare and xAd (now GroundTruth) ($116 million and $166,35 million accordingly). 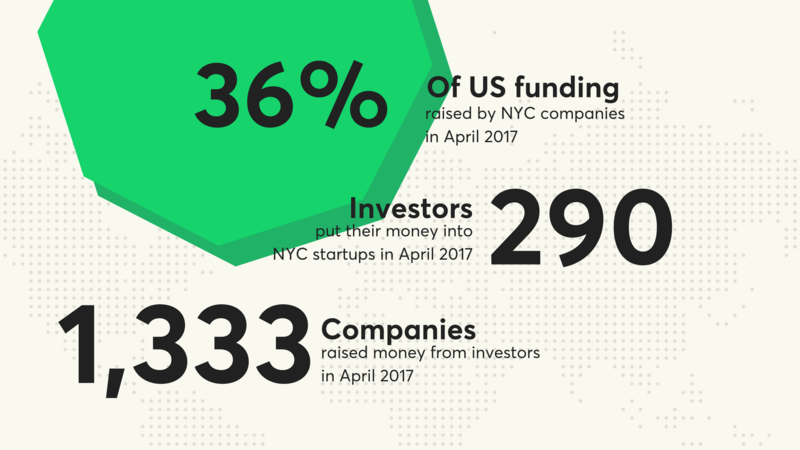 In April 2017, NYC had a whopping 36% share of total US funding with more than 290 investors pouring money into 1333 business. 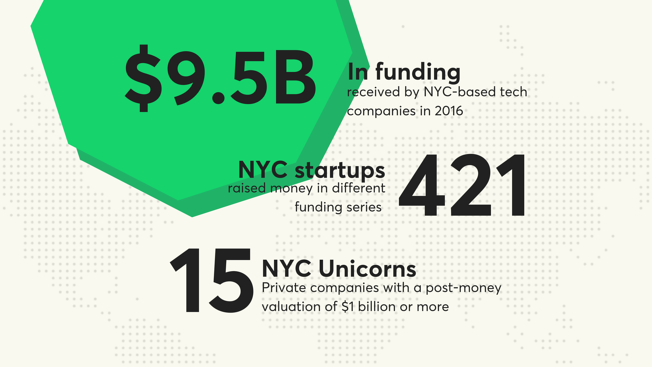 This data illustrates why NYC is a perfect place for startups to get funding. There are numerous accelerators, venture funds, and angel investors ready to invest in the booming NYC tech market. The New York tech scene is known for many prominent angel investors - individuals who specialize in investing in tech startups. One of the best known is Adam Rothenberg, the partner at BoxGroup, who has made over 50 angel investments into startups such as Vine and Blue Apron. Startups can also get funding from powerful angel groups, such as New York Angels, a company that funded many successful startups including Waywire Networks, Moven, and AllTheRooms. In addition, NYC has one of the richest and active venture funds. For example, Lerer Hippeau Ventures has successfully invested in New York’s hottest upstarts including BuzzFeed and Warby Parker. Other notable venture capitalists to seek funding from are RRE Ventures and Union Square Ventures. The first one has stakes in Buzzfeed, Venmo, Bitly, Datadog, Business Insider, and more. Union Square Ventures boasts investments in FourSquare, Codeacademy, Tumblr and other famous startups in its investment portfolio. New startups can easily access venture capitalists via a developed infrastructure of accelerators that includes the influential Grand Central Tech with impressive roster of NYC startups, a start-up studio Betaworks that discovered Giphy and Tumblr, and an early stage fund Entrepreneurs Roundtable Accelerator. Unicorn is a private company with a post-money valuation of $1 billion or more. According to CBInsights, the United States is home to 105 unicorn companies of which 15 unicorns come from New York. The NYC co-working startup WeWork is the third largest unicorn in the country valued at $20 billion. NYC unicorns are concentrated in digital media/entertainment, AdTech, and HealthTech. The four AdTech unicorns are AppNexus - a programmatic advertising company ($1.6 billion), MediaMath - an advertising exchange ($1.1 billion), Sprinklr - a SaaS platform for social media management ($1.8), and Zeta International ($1 billion), a marketing-tech pioneer that leverages big data and machine learning to help companies build their marketing campaigns. Similarly, NYC has a powerful digital media sector featuring such unicorns as Vox Media (a $1 billion company publishing The Verge, Vox and Recode), BuzzFeed - the social news and online publishing platform ($1.5 billion), and Vice Media ($2.5), a global youth media company that covers domestic and international news. Finally, the booming HealthTech sector is represented by Oscar Health Insurance ($1.5) and online health service provider ZocDoc ($1.8 billion). Among standalone unicorns, one should mention the grocery delivery service Blue Apron ($2 billion), the music identification service Shazam ($1 billion), and the Fantasy Sports platform FanDuel ($1.3 billion). After a decade of fast development, the NYC tech scene is entering a period of maturity and integration. With the growing amount of investment flowing into established unicorns and public companies, we are likely to witness the emergence of the large tech companies similar to Apple, Google, and Facebook in Silicon Valley. Notwithstanding a gradual slowdown of the investment activity, over these years an excellent infrastructure that supports tech industries has been developed. Numerous accelerators, workspaces, government initiatives, business associations have already turned NYC into a powerful tech hub rising out of its own momentum.